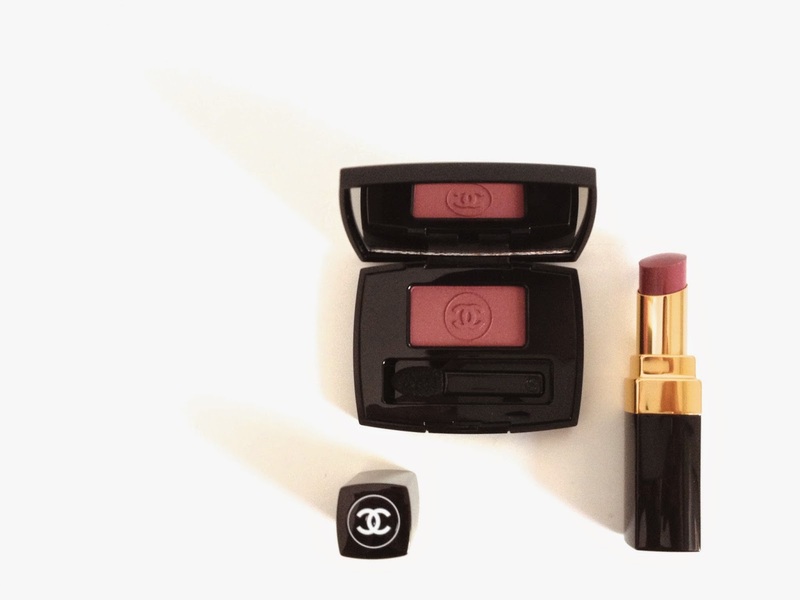 When a few months ago the Chanel Fall Collection, États Poétiques, started to appear on the web I knew one thing was made for me: one of the Rouge Coco Shines. No shimmer, more color pay off? Count me in! I can’t get enough of sheer comfortable lipstick formulas. When I spotted the new collection at Sephora the things that were made for me, as it happens, became two. And so I left with the Ombre Essentielle in 106, Hésitation and the Rouge Coco Shine in 94, Confident. As you can see it’s all a bit matchy-matchy there, but this doesn’t stop me to wear them together, as you can see in this Instagram picture. Hésitation is a gorgeous pink plum that pulls a bit burgundy with the softest color-coordinated shimmer running through, and is wonderfully blendable. My favourite way to wear it is on the lid blended softly at the crease, with a simple line of black liner (my trusty Benefit They’re Real Push-Up liner!). As a bonus its red tones really make the green tinge of my eyes really stand out, and I love anything that does that! Confident is a dark plummy pink that goes on smoothly on the lips leaving a gorgeous hint of colour with one swipe. With two it becomes more intense and looks more like muted plum on my fairly pigmented lips. It’s as gorgeous as I was hoping it to be! Together they make the perfect make up for the upcoming autumn, which as you may have noticed I can’t wait for! Have you picked anything up from this collection? Are you planning to do any autumn-inspired purchase? Quando qualche mese fa la collezione autunnale Chanel, États Poétiques, incominciò ad apparire online capii subito che una cosa era fatta per me: uno dei rossetti Rouge Coco Shine. Senza shimmer, e con più colore? Eccomi! Non posso sottrarmi a una formula trasparente e confortevole. Quando ho visto la nuova collezione da Sephora le cose fatte per me, come spesso capita, sono diventate due. E così ho portato via con me un Ombre Essentielle in 106, Hésitation e un Rouge Coco Shine in 94, Confident. Come potete vedere è tutto un po’ matchy-matchy, ma ciò non mi ferma dall’indossarli insieme, come potete vedere in questa foto su Instagram. Hésitation è un meraviglioso rosa prugna che tende un po’ al bordeaux con meravigliosi shimmer dello stesso colore, e si sfuma meravigliosamente. Il mio modo preferito di portarlo è sulla palpebra sfumato leggermente al confine con la piega, con una semplice linea di eyeliner nero (il mio fidato Benefit They’re Real Push-Up Liner!). In più accentua la componente verde dei miei occhi, e adoro qualunque cosa lo faccia! Confident è un rosa prugna scuro che scorre morbidamente sulle labbra lasciando un meraviglioso velo di colore con una passata. Con due diventa più intenso e sulle mie labbra piuttosto pigmentate appare come un tenue prugna. È meraviglioso come speravo che fosse! Insieme sono il look perfetto per l’autunno in arrivo, che come avrete notato aspetto con ansia! Avete acquistato qualcosa di questa collezione? Pensate di fare qualche acquisto ispirato all’autunno? Confident is a gorgeous shade - I'm yet to try any Chanel lipsticks but I'm hoping to break that soon! Well it won't be an Hesitation for me... ! Love it ! I want that gorgeous lipstick in 'Confident' ! Great picks, Gyudy! In love with both picks! The lipstick is such a gorgeous shade! Hey Gyudy, you picked out two pretty pieces that are perfect for fall! I have quite some stuff from the collection. My favorites include Poesie, Aura, and Viva! Gorgeous, can't ever go wrong with Chanel!